click here During our October meeting, we enjoyed a visit from five of San Diego’s bravest and “hottest” firefighters who reported on the state of equipment and how Friends of Del Cerro (FDC) has been able to raise enough money to provide all fire trucks with equipment they had been lacking. Now FDC is raising money for chainsaws for our firefighters. You can learn more and donate to this worthy cause at friendsofdelcerro.org/san-diego-fire-rescue. Battalion Chief Dave Seneviratne told us that they had responded to two different fires within the last month. The first was near Mast and West Hills Parkway where 20 firetrucks, two helicopters and two water drops from planes were deployed. The second fire destroyed a 15-by-15-foot area in the vicinity above Tuxedo Park containing a homeless encampment. Seneviratne handed out brochures from the Burn Institute about “Fire & Burn Prevention for Seniors.” If you are 62 or older and own your home, you are qualified for the Burn Institute’s free smoke alarms, or inspection of your existing smoke alarm. To learn more, call 858-541-2277. Ryan Trabuco from state Senator Toni Atkins’s office reported on the passage of a bill that Sen. Atkins worked on for the last two years, which teaches hotel and motel employees how to recognize signs of human trafficking. He also brought some great pumpkin chocolate chip cookies to share with everyone. Lisa Scott from the office of Councilmember Scott Sherman paid us a visit and handed out the District 7 Dispatch. The headlining story focuses on the removal of five tons of trash and debris from fire-prone canyons. There is also the announcement of a Free Flu Shot Event in October for seniors. The city is partnering with Sharp HealthCare to create a citywide wellness program. For information call 800-827-4277. Scott mentioned that Councilmember Sherman will be present at the ribbon-cutting of the 24-Hour Fitness Super Sport facility on Nov. 1. The gym will hold a grand opening for the general public on Nov. 3. Our president, Mark Schulze, mentioned that he had seen a news story about San Carlos neighbors reporting brownish “smelly” water coming out of their taps. Scott said that Sherman’s office had looked into it immediately. Technicians who inspected the water determined that the cause was a naturally-occurring chemical found in soil called geosmin. The water has been deemed safe to drink. Our guest speaker at the Oct. 3 meeting was Dr. Cherry Robinson, Psy. D., volunteer climate leader at the Climate Reality Project. 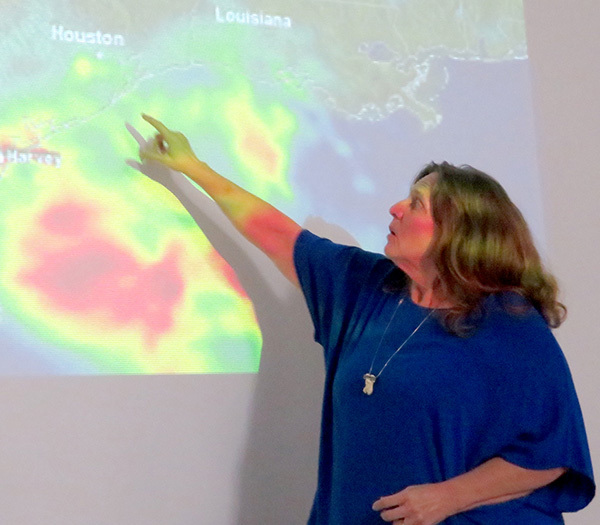 Her slide show illustrated to a packed house of interested observers how weather events like hurricanes and wildfires are a direct result of sending greenhouse gases and methane into our atmosphere. Dr. Robinson showed us how we are all linked, and that thousands of people displaced due to natural disasters in various parts of the world have a direct effect on all of us. Hope is alive with all the inroads we have made with alternative energy. To learn more about the Climate Reality Project, visit climaterealityproject.org. Join us at the next meeting of the San Carlos Area Council (SCAC) on Wednesday, Nov. 7 order now , at 6:30–8 p.m. in the San Carlos Branch Library, 7265 Jackson Drive. Several representatives of elected officials will provide their reports of the latest news and answer your questions and concerns. Consider becoming a member the SCAC. The dues are modest ($7 per household). Help support this local volunteer-run organization by sending a check to: SCAC P.O. Box 19246, San Diego, CA 92159-0246. If you wish to be added to the Interested Persons List or have a topic you would like to learn about, please contact San Carlos Area Council Secretary Mickey Zeichick at mrzeichick@gmail.com. —Patricia Mooney is vice president of the San Carlos Area Council. Reach her at patty@crystalpyramid.com.